Following a turbulent down spiral, the Swiss Federal Statistical Office (FSO) is reporting a rebound in tourism figures for 2017 with a staggering 37 million overnight stays, an increase of 5.2% year on year and almost enough to beat previous records made in 2008. The Swiss tourism industry is crediting part of the rebound to a 4.2% increase in domestic tourism that resulted in nearly 17 million stays, from many Swiss citizens adhering to time honoured trends of overnight or weekend breaks. However, they are also keen to point out foreign visitors also returned to the country with an increase of 2.2% Europeans, who had previously stayed away because of a strong franc. The euro gaining strength reversed this effect to bring the cost of Swiss holidays in line with earlier years. 12.3% Americans and the same percentage for Asian nationalities, also returned to Switzerland after the Europe terror attacks lessened and reinstalled confidence in the travel sector overall. 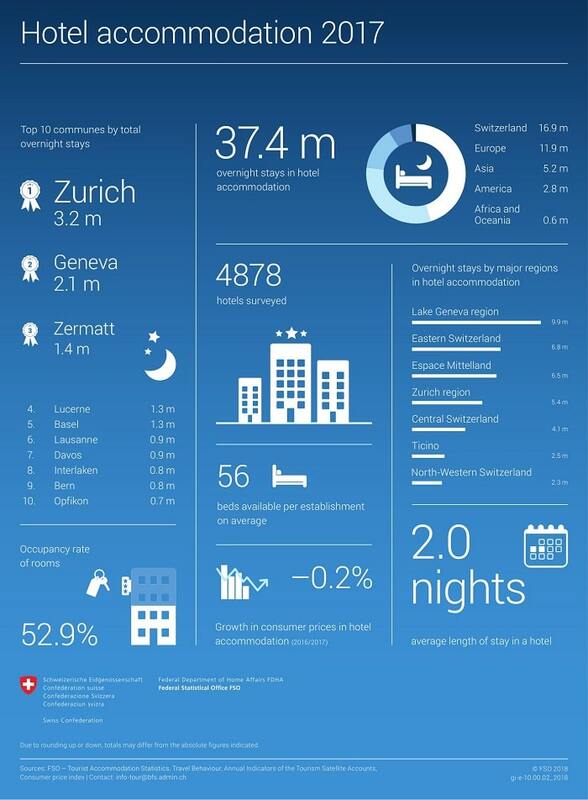 All 13 tourist regions increased in overnight stays, but the best performer was the Bern Region with an increase of 8.2%, closely followed by Zurich with 6%. The average length of stay was 2.1 nights for foreigners, and 2.0 for domestic travellers. Regions also reported differences with tourists only staying an average of 1.6 nights in Fribourg but rising to 2.7 nights in Graubünden, one of Switzerland’s top visited destinations. Net occupancy room rate rose from 51.3% in 2016 to 52.9%. Strong performing districts were Geneva with a net occupancy rate of 66.3% and Zurich with 64.6%. Eastern Switzerland was one of the worst performers with 39.7%. What Draws Tourists to Switzerland? Many factors lure tourists from other countries to Switzerland but no doubt, a strong reason is gorgeous landscapes giving way to a diverse range of outdoor activities, in particular, the Alpine mountain range, one of the top skiing destinations in the world. Taking off in the early 19th century, for many decades, wealthy and influential members of society dominated Alpine tourism but as travel started to gain popularity, companies like Thomas Cook began to sell package skiing and mountaineering holidays. The Swiss tourism industry is accountable for more than 144,000 jobs, roughly 4% and income is an integral part of its economy. As the sixth most significant industry, Swiss tourism has branched out to accommodate every niche including summer destinations, lakeside retreats, spa and business tourism. Having always had strong demand from European nationalities such as Germans, as well as Brits and America, Switzerland is increasingly turning to markets such as China, Russia and India to ensure its growth. Putting forward the Alps as one of the best reasons to visit, they are keen to change the belief of it only being a winter destination. They also want to adhere to sustainable tourism practices to preserve the landscape because of its hefty contribution towards the economy.